As equipped for the driver, as it is for the road. front seats and a power sliding-glass moonroof. mounted controls and voice command. CONQUER MORE HIGHWAY ON LESS FUEL. 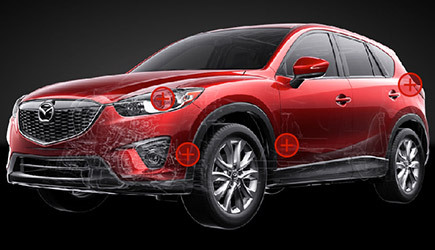 2.0L SKYACTIV®-G-powered CX-5 with best-in-class EPA-estimated 35 HWY-MPG, better than all other SUVs-even hybrids. Traction for all roads and seasons. 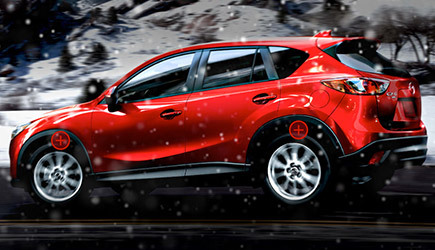 With Mazda’s available smart traction technology, the Mazda CX-5 helps you conquer challenging terrain and weather. Active Torque Split All-Wheel Drive can instantly adjust power between the front and rear axles to take advantage of available traction and help you stay in control. 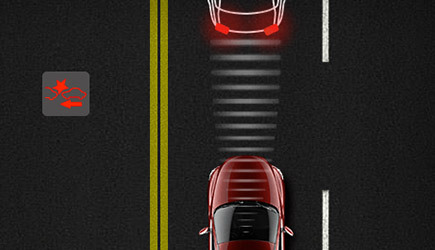 And thanks to SKYACTIV®-TECHNOLOGY, there’s little burden on your fuel economy. Catches the eye, not the wind. 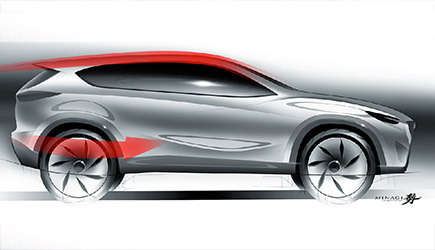 Inspired by the predatory stance of an animal stalking its prey, the Mazda CX-5’s KODO “Soul of Motion” design captures the essence of poise, aggression and power. Yet there’s more to those curves than what meets the eye; each was meticulously sculpted to slip through the wind with the least resistance while shifting weight rearward for greater stability. Creating true harmony between form and function. We obsess over safety so you won’t have to.